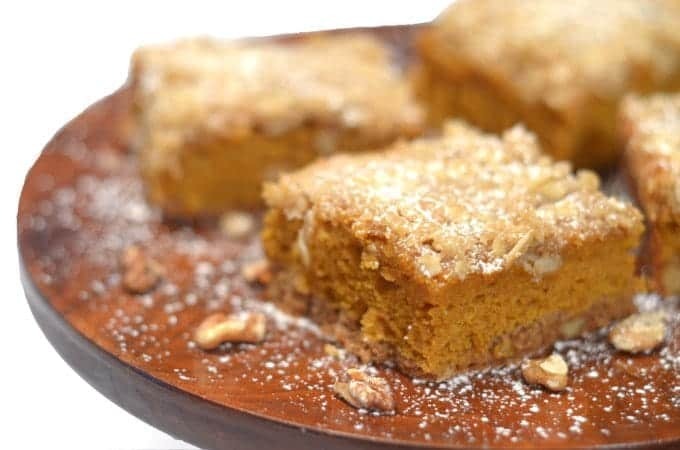 Part pumpkin cake, part pumpkin pie, these Pumpkin Spice Cake Bars are all delicious. Don’t get me wrong, he wasn’t the only member of the household to fully loved these Pumpkin Spice Cake Bars. Aside from yours truly, the rest of the boys in the household all gave this one a thumbs up. I think you will too when you find out just how easy and tasty these are to enjoy. 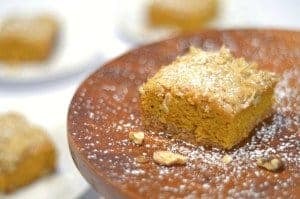 These Pumpkin Spice Cake Bars start with a spice cake mix from a box. 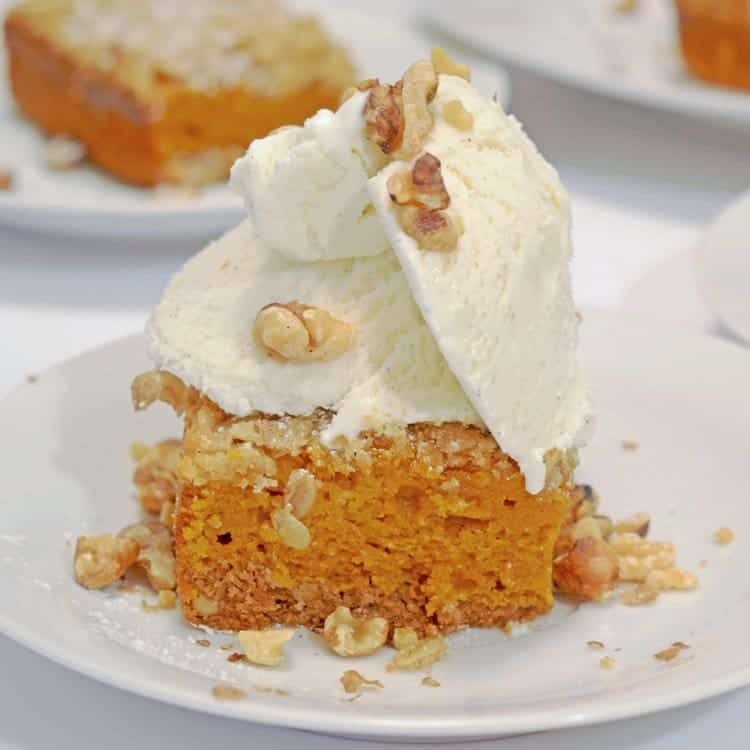 Part of the mix acts as a base and the other half is added to the next layer which is combined with packed pumpkin and sweetened condensed milk. Hopefully, your salivary glands are starting to kick in, and you are beginning to get the picture. There’s more though! We toasted some walnut pieces to add to the base; these provide a bit more structure and of course their warm flavor. Many times, our boys don’t care for nuts in their desserts. There was nary a word of opposition in this case. Of course as with any recipe, nuts are entirely optional for those with allergies or other aversions to them. Reserve ½ cup dry cake mix. In a large bowl, combine remaining cake mix, 1/4 cup of oil and 1 egg; Beat until crumbly. Stir in nuts. Press firmly on the bottom of 13"x9" pan. In the same bowl combine remaining ingredients (Not including the oatmeal streusel) and mix well. Pour over prepared crust. Place the 13"x9" pan on a cookie sheet (to prevent excessive browning on the bottom) then place and in a 350°F pre heated oven for 15 min. To prepare streusel combine all dry ingredients and cut in butter until the mixture is crumbly. After the first bake time of 15 minutes has elapsed remove the 13"x9" pan from the oven and spread the streusel topping evenly over the top of the pumpkin bar. Place back in the oven on the cookie sheet to prevent the bottom from getting to dark. 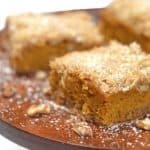 Bake your pumpkin oatmeal streusel bar until set and the top is golden. Baking this in Denver CO. The last half took approximately 20 – 25 minutes to set. I agree some kind of baking time range would be helpful. 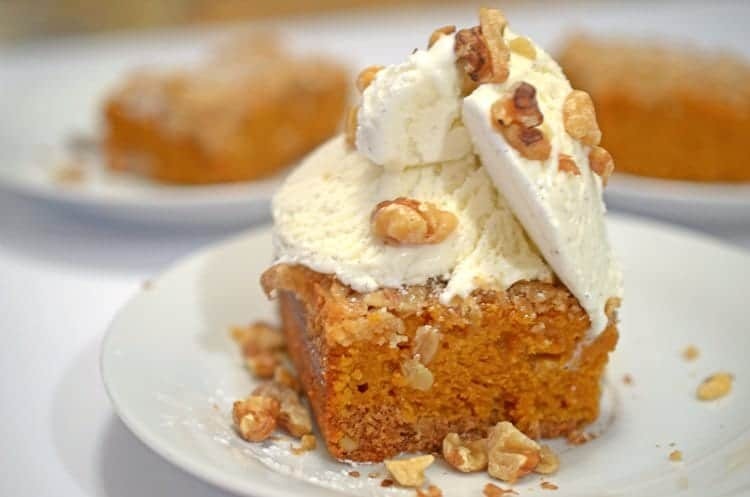 Thanks for the input for this pumpkin dessert, Marian. We will make some revisions to include this information. We really appreciate your feedback! No need to post…I see. Where does the extra oil & cake mix go? A baking time after putting it back in the oven would have been appreciated. Hi Cindy. I couldn’t agree more with you, a baking time would indeed have been appreciated for the second part of this recipe. Sadly, there is no specific time for when the bars will be done, at that point. Rather, your senses and feel for the end product have to come into play here, with some diligent attention to what is going on inside of the oven. To reiterate, per the recipe’s instructions, they are done and ready to come out when the streusel has set and the top is a golden brown. But truly, a time range would be helpful 5-15 minutes, 15-30 minutes, approximately an hour? Thanks for the comments, Holly. I can’t for the life of me think of any dessert bar that would need an additional hour’s baking time. That being said, these bars spend 15 minutes for the initial part of their baking process. 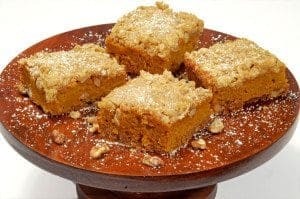 After the streusel topping is placed on top of the bars, an additional 5 to 8 minutes should be all that is necessary until the bars have set and they are ready to come out of the oven. Most importantly, because baking time can vary due to factors such as oven variability and altitude, monitor the bars and when they appear firm and set in the center then they will be ready to enjoy. These sound and look outstanding! Love that streusel topping, too. They seem like they would been super moist, yet still cakey enough to hold up. Thanks! Yummy! Perfect for all those upcoming holiday gatherings. Now this is a delicious Fall dessert! Of course I would top off with ice cream also but I have no doubt this cake is delicious without it. What a great idea this is. The end result looks amazing. Thanks, Patty; I haven’t met a pumpkin I don’t like! What a lovely presentation. Perfect for Fall. What a perfect way to end a meal, sweet treat! These look wonderful! I love the oatmeal streusel topping! WOW!! That’s all, but I’ll say it again, WOW!!! I’ll take a woe from the enormously talented Susie Gall, any day! Thanks so much! These look AMAZING! Perfect fall dessert! Thanks so much Serena; I think you would enjoy these! 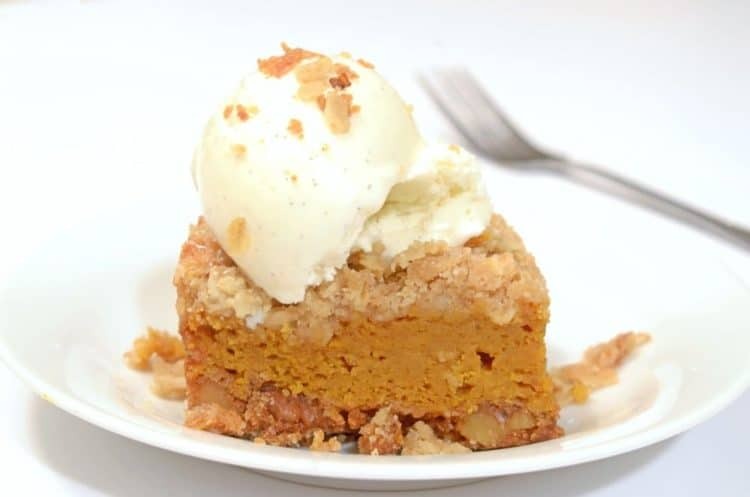 oh yeeeees, the pumpkin, the ice cream, make me so hungry, craving this in a major way! Love these bars! These look amazing, and that topping? Oh my. 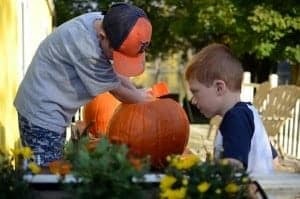 Great bars for this time of year! I love the oatmeal streusel topping and toasted walnuts into the crust. Best of all, the ice cream on top must be heaven! 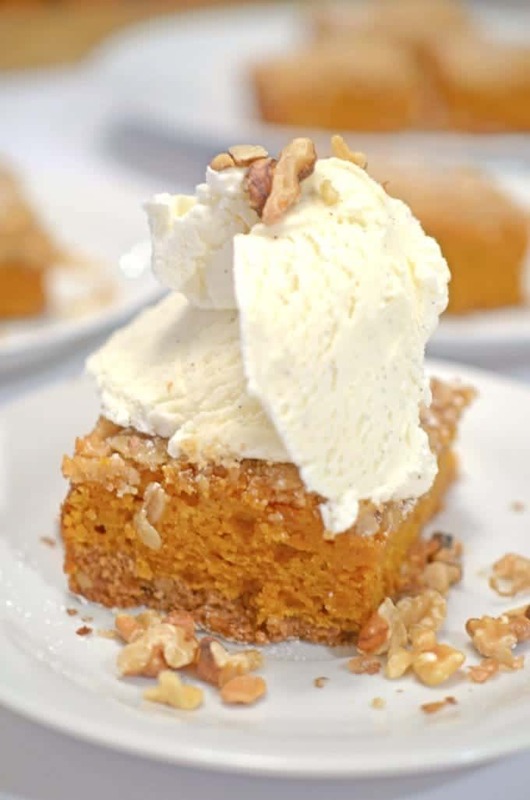 Pinning to my pumpkin everything board, I love the idea of pumpkin bars! Happy that you like this one, Sara!